Finally, the United States has a president with the brains and the guts to stand up to the menace of the north. This weekend President Trump called Canadian Prime Minister Justin Trudeau "meek," "very dishonest & weak" for protesting U.S. tariffs. Trump's trade adviser said "there's a special place in hell" for Trudeau, and Trump's economic adviser said Trudeau "stabbed us in the back" and is guilty of "betrayal" and "double-crossing." How do you feel now, Canada? Or, to put it in a language you understand: How's she bootin'er? Trudeau earned his place in the underworld for some truly appalling rhetoric, saying "we're polite, we're reasonable, but we also will not be pushed around." Offensive! He also found it "kind of insulting" that the Trump administration said it was imposing tariffs on Canadian goods "for a national security reason" given that Canadians "stood shoulder to shoulder with American soldiers in far off lands in conflicts from the First World War onward." Trudeau conveniently omits the invasion of Detroit from Canada in 1812. And there was that ugly dispute in 1844 when soon-to-be President James K. Polk wanted the U.S. border to extend all the way north to Alaska at 54 degrees, 40 minutes latitude (slogan: "Fifty-four forty or fight!") but was forced to accept the 49th parallel, a humiliation that denied us Vancouver and many great Chinese restaurants. And let's not even get started about the softwood lumber dispute. Too painful. 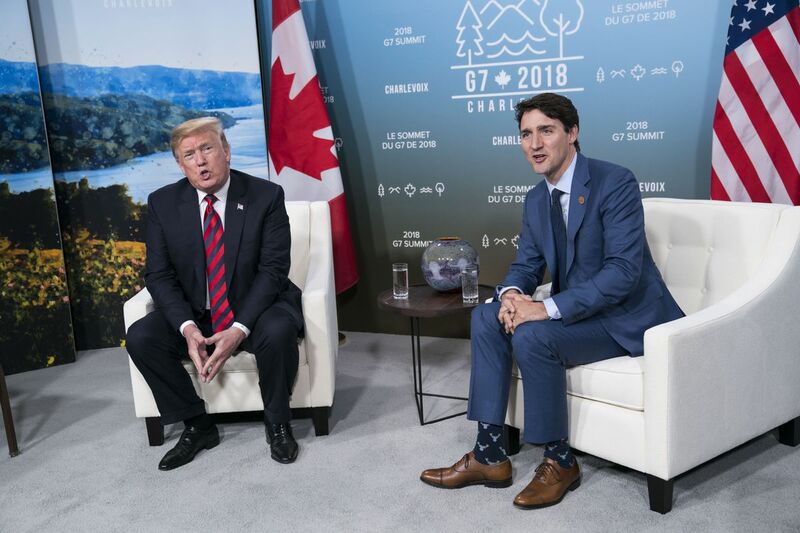 Trump bravely punished Canada by withdrawing the United States from the communique of the weekend's Group of Seven meeting, which was hosted by Trudeau. The communique Trump rejected is loaded with objectionable provisions such as "a clean environment," "a healthy, prosperous, sustainable and fair future for all," "quality work environments," "a more peaceful and secure world" and "ending violence against girls and women." In other words, it was like all the other bad, terrible, crazily made, one-sided, miserable deals that make us the laughingstock of the world — such as the North American Free Trade Agreement, the Trans-Pacific Partnership, NATO, the Paris climate accord and the Iran nuclear deal. The communique was particularly hostile to Trump in its call for "Russia to cease its destabilizing behavior to undermine democratic systems," condemnation of Russia's "illegal annexation of Crimea" and commitment to "a strong stance against human rights abuse." Such language targets the very countries Trump has been courting. In a further insult, the other G-7 leaders had no enthusiasm for Trump's call for readmitting Russia, which was kicked out of the club for invading Ukraine. The G-7 leaders instead scowled at Trump, called his actions a "disappointment" and criticized his "fits of anger." Rodrigo Duterte of the Philippines, who enjoys "a great relationship" with Trump as he deploys extralegal killing squads. North Korea's Kim Jong Un, who is "very open" and "very honorable" in running the most repressive regime on Earth. Egyptian dictator Abdel Fatah al-Sissi, who established himself as a "fantastic guy" with his bloody crackdown on dissidents. The Saudi regime, which has been "tremendous" as it purges business leaders and critics. Turkish President Recep Tayyip Erdogan, who is "getting very high marks" as he jails opponents. China's premier, Xi Jinping, who did something "great" in making himself president for life. And, of course, Russian President Vladimir Putin, "getting an A" for his leadership and receiving a congratulatory call from Trump after his "election." There is no room in this G-8 for Britain, France, Germany, Italy or Japan — and certainly not Canada. Canadians say "sorry" for everything. But Trudeau not only failed to apologize to Trump, he won praise from his political opponents for defying Trump. This is a clear and present danger to the United States. Given Canadians' well-known instability — their currency is called the "loonie" — there can be only one solution: We are going to build a wall from Maine to Alaska — and Ottawa is going to pay.